LONDON – Harold Pinter’s masterpiece “The Caretaker” mirrors life in that it’s not entirely clear what’s going on but the joy, pain and despair are real. 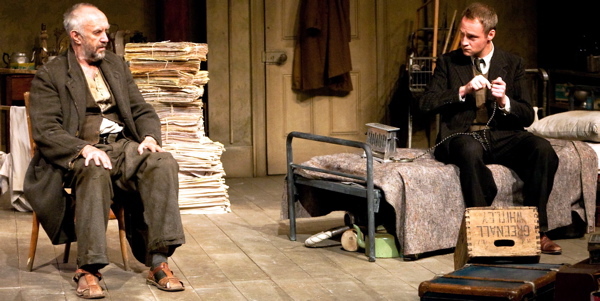 Not that there’s much joy in the late Nobel Prize-winning playwright’s tale of a tramp and his two masters but Jonathan Pryce in the title role makes full use of everything else with masterful skill. As Davies, the down-and-out scavenger who stumbles upon a job looking after a ramshackle apartment, the Welsh actor speaks mostly with his native accent but he deliberately lets it slide over the British landscape and up and down the social scale as the situation requires. Pryce contrives to have Davies turn on a dime from pathetic neediness to sulky insolence to buoyant high spirits and back again. Vocal adroitness matched by physical agility combine with a palette of nuanced expressions with which he creates an unforgettable portrait of pitiful adaptability. Peter McDonald plays Aston, the sympathetic compulsive obsessive who offers him a place to stay in return for looking after his shambles of an abode, with Sam Spruell as his brother and alter ego Mick. McDonald is all soft edges and furrowed brow as Aston attempts to deal with the demons that took him into a mental institution while Spruell has Mick strutting and bossing everyone about. Like Davies, however, the brothers are not what they seem, and Pinter’s onion peeling can seldom have been shown to better advantage. Director Christopher Morahan moves the three characters about Eileen Diss’ impressive set with its bizarre and banal collection of useless items, like pieces on a chessboard. The tension of Pinter’s elided interplay is heightened by the dankness the set gives off and it is given full measure by three talented actors led by the always surprising and rewarding Pryce. This review appeared in The Hollywood Reporter. Photo by Helen Warner. This entry was posted in Reviews, Theatre and tagged 'The Caretaker', Christopher Morahan, Harold Pinter, Jonathan Pryce, Peter McDonald, Sam Spruell, Trafalgar Studios. Bookmark the permalink.